Over 800 people descended on the Melbourne School of Design to see world-renowned architect Jean Nouvel appear in an intimate conversation with publisher Andrew Mackenzie and Dean of the Faculty of Architecture, Building and Planning Professor Daryl Le Grew. The sold–out event attracted staff, students, industry and the public alike, all eager to see and hear what one of the modern world’s most well-known, innovative and respected architects had to say about the past, present and future of architecture and design. Mr Nouvel, Mr Mackenzie and Professor Le Grew touched on the themes of interiority and exteriority, context and culture. They discussed the concept of risk, the evolution of practice, the reinvention of the Tower and the mediation of architecture. Mr Nouvel urged both future and established architects to embrace architecture as a philosophical enquiry. He recalled his time as an emerging architect in Paris in the 1960s, a time when architecture was intimately connected with art, cinema, philosophy and photography. He has ensured that these artistic elements, to this day, shape and direct the design and construction of his own projects, and urged aspiring and established architects to experience poetry, imagery and aesthetics to shape their spirit and foster creativity, “Architects must have a poetic vision for the way we will live in the future. Forego the rational”. 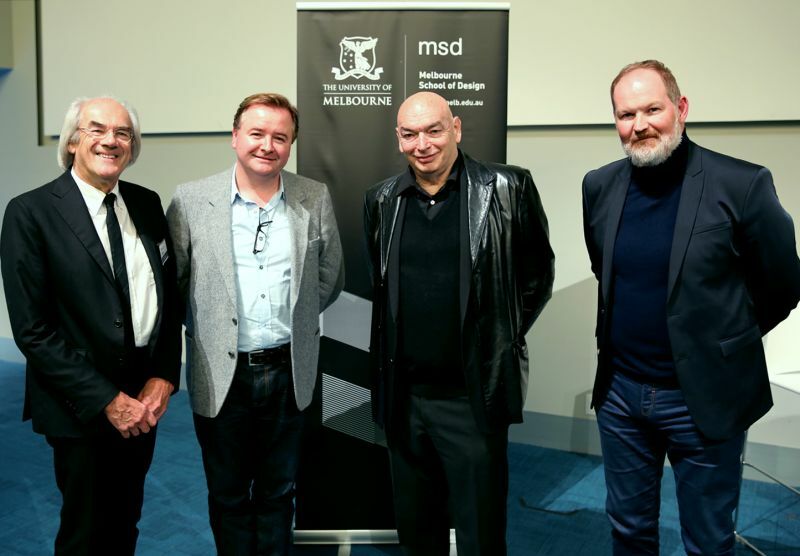 Left to right: Interim Dean of the Faculty of Architecture, Building and Planning, Professor Daryl Le Grew, publisher Andrew Mackenzie, Jean Nouvel, Director of the Melbourne School of Design, Professor Alan Pert. He emphasised the influence that both history and geography have had on him over the years, acknowledging that he feels very strongly about the history of our urban geographies. “History breaks up urban monotony. The homogeneous effect of globalisation must be taught against through valuing history. If a city is degraded its soul is degraded. We must design for its soul. The modern passion for demolition left us without the foundation for our ideas,” he said. Mr Nouvel’s closing comments highlighted the commitment, dedication, creativity and hard work that is required to be truly successful as an architect, and to positively contribute to society through architecture, “Young architects must accept their career will be ever-challenging. Architects must see problems with and around projects with open eyes. Don't turn a blind eye. I will defend the hard work and long hours of architects until the very end”.